Sony's cheapest LTE smartphone - that is the Xperia E3 key selling point, but is there more to it than that? With the same design language as the Sony Xperia Z3 and Z3 Compact, the E3 looks well up-to-date and gives you the latest Android KitKat decked out in Sony team colors. Aiming for a low price point is always going to involve some corner cutting but, as Motorola's Moto G has shown, the overall experience doesn't necessarily need to be sub-par. We can probably live with the not-too-slim bezels, but we won't put up with poor performance. Fortunately, the Snapdragon 400 inside the Xperia E3 has a good track record and the WVGA resolution shouldn't put too much strain on it. Before we go any further, let's check the Sony Xperia E3 review cheat sheet. The Sony Xperia E3 is an improvement over its predecessor in every way possible, which is probably why Sony chose to skip through E2 - the two digit improvement was needed to underline the big jump forward. Sony prides itself on the battery performance of the Xperia E3, the company says it could go a full two days thanks to its 2,330mAh battery and STAMINA mode optimizations. We've yet to confirm that claim but it could potentially become a stand-out feature in a market where entry-level smartphones can barely make it through the day. That, along with the premium design, the LTE radio and the exclusive built-in software should help the Xperia E3 withstand the pressure from 720p screen-packing competition. While clinging close to stock Android, the Xperia E3 has the custom Xperia UI with the What's New panel, TrackID, Album, Walkman, Movies and Xperia Themes, to name a few. 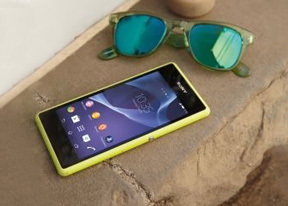 It isn't like us to deny a smartphone a fair hearing and the Xperia E3's trial begins after the break.